Piano Opening Hours: Daily 24/7. Piano donated by Stuart Nolan and decorated by Tadros Hanna, with thanks to the Asylum Seeker Resource Centre. Hosted by Goldsbrough Lane. Thank you MS. Anna Nolan for donating this amazing piano to give me a chance to decorated and share my art with people in Melbourne streets. so proud and inspired from this junior tour. 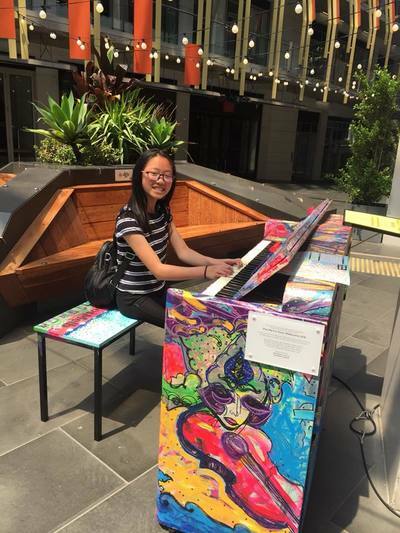 I Liked the idea that pedestrians in Goldsbrough Lane stop by my designed piano to see it and try to play ..
My friends went specialy to Goldsbrough lane at Melbourne CBD to see and enjoy my designed piano. They tried to play piano even if they don't know ..
Tadros Hanna friends and their children go specialy to Goldsbrough to see the piano and try to connect with it . Today and tomorrow is last chance to come and connect with Tadros Hanna designed Piano at Goldsbrough Lane at melbourne CBD. Next it will be displayed at Alfreda Street St Albans Vic 3021 Melbourne Australia. Tadros Hanna is so proud of being a part of Play Me I'm yours Melbourne 2018 ,as a visual artist decorating this piano and meeting amazing people . Many Thanks to Emma , Sally and Lill for all your kind support. Tadros Hanna with Elle from THE AGE durning their video shooting . My designed piano ,Luke Jerram interview at the launching at Hammer hall Melbourne. My son Youssef got inspired at Goldsbrough Lane Melbourne CBD ( Play Me I m Yours Melbourne 2018) ,and composed his own music. Every one enjoyed my piano design and colors at Play Me I'm yours launching Melbourne2018. 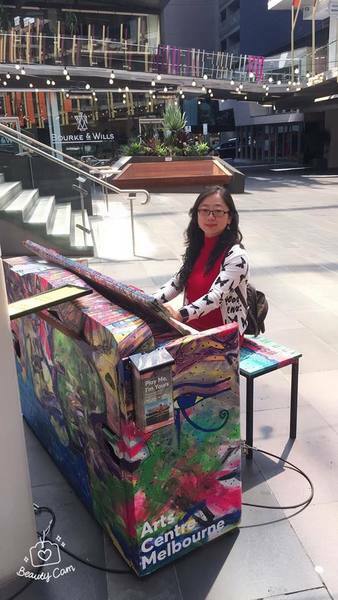 Nice street pianos Tour at Melbourne 2018 by Dr. Yvonne Ho Am. Tadros Hanna is so proud of his designed Piano to be a part of Play Me, I'm your Melbourne 2018 .